A couple of easy peasy salads for your turkey day table…..
Not sure why I’ve not posted these recipes — they are two of my most requested. My fantastic mother-in-law introduced me to the Oriental Crunch Salad, and my brother won’t let me come for Thanksgiving lunch if I don’t bring the Pineapple-Cranberry Salad. I love CRUNCH, and these salads live up to the challenge. It’s not too late to serve to loved ones on your Thanksgiving table tomorrow (or whenever you gather for the holiday)! Mix together the shredded cabbage and chopped green onions. Set aside. You can make everything ahead of time. Keep separate until about 15 minutes before serving time. Put the crunchies over the slaw and pour the dressing over all. Stir well. Drain pineapple, reserving juice. Add enough cold water to juice to measure 3 cups; pour into saucepan. Bring to boil; remove from heat. Add jello mix and stir for 2 minutes or until dissolved. Stir in cranberry sauce. Pour into serving bowl, and refrigerate for 1.5 hours or until slightly thickened. Stir in pineapple, apples and pecans. Refrigerate until firm. Yummo! I want to share a recipe that I made on Christmas (well, I didn’t make it, I just thunk it up) – there wasn’t any left for seconds! I had decided to make my favorite risotto recipe, Mushroom and Pea Risotto but thought I would try adding asparagus, knowing my family loves it. The best part is that my MIL asked “how can I help” and from there it was on!!! She’s one of my fave peeps in the world, and she was kind enough to stand and stir for about 40 minutes. Meet Debbie, the happy risotto maker! Oakley was a little sleepy for the recent K State bowl game win, but she was awake to learn the tomahawk chop during the KC Chiefs AFC WEST CHAMPION game (yeah, she did nap a little during halftime). Hope you had a wonderful and safe holiday, here’s to 2017! Take cooked rice, throw in a little this and that, and voila, in 20 minutes you’re good to go! Hope you enjoy, and are cheering for the 2015 WORLD SERIES CHAMPION KANSAS CITY ROYALS on Sunday for their home opener. It also happens to be my birthday, so I’ve declared it a national holiday!!!! I had never made risotto until last fall, but if you have a little extra time to devote, it’s really amazing. I adapted this recipe from Rice Select arborio rice, which is risotto. If you don’t know what arborio rice is, here ya go — little pasta thingys that look like rice. They turn really smooth and creamy with whatever you throw in with them. Not hard to make, and I encourage you to give it a whirl. Have patience and it’s worth it, plus whatever white wine doesn’t go into the risotto, drink it 🙂 Hope you enjoy, and if you have variations, please share in the comment section below. And, if you like this recipe, try my Mushroom and Pea version. Like what you see here? If you’re not following my blog, enter your email address and you’ll have some easy dishes delivered right to your inbox. Thanks, and keep cooking! Heat water and broth in 2 qt saucepan over medium heat until it comes to a simmer. Reduce heat to low and keep warm. Meanwhile, melt 2 tbsp butter in large saucepan over medium heat; add asparagus and cook until tender crisp. Remove asparagus; set aside. In same saucepan, cook onion in remaining 1 tbsp butter until soft. Add rice and stir 2 to 3 minutes, careful not to burn. Add wine; stir until absorbed. (drink rest of wine) Increase heat to medium high; stir in 1 cup water-broth mixture. Cook uncovered, stirring frequently until liquid is absorbed. Continue this process, one cup at a time, allowing each cup to absorb before adding more liquid. (you may need more wine at this point) Cook until rice is tender and mixture has a creamy consistency, a total of 25-30 minutes. Stir in asparagus, cream, cheese, salt and pepper. Stir until mixture is creamy, about 2 to 3 minutes. Serve immediately, and refrigerate any leftovers. I scored this recipe off The Kitchen, thank you Katie Lee, and although it was touted as a Thanksgiving and holiday recipe, I made it tonight and we enjoyed it with marinated, grilled flank steak (amazing). This was super easy and delish, and if you don’t want to include the glaze, the roasted sweet potatoes were to the moon on their own (I had to do a little tastey tastey). Yes, I need to break loose and buy a new one (with insurance.) This weather makes me miss boating life, so am sharing a pic of my boat, which I miss! Can’t wait for March!!!! Actually looks better now since I’ve added a KSU and American flag to the antenna! Enjoy this time leading up to the holidays, and pray for our friends in France and those working so hard to keep us safe here in America, where we are soo lucky to live! I know I have followers from several other countries, so prayers to you as well for your safety! 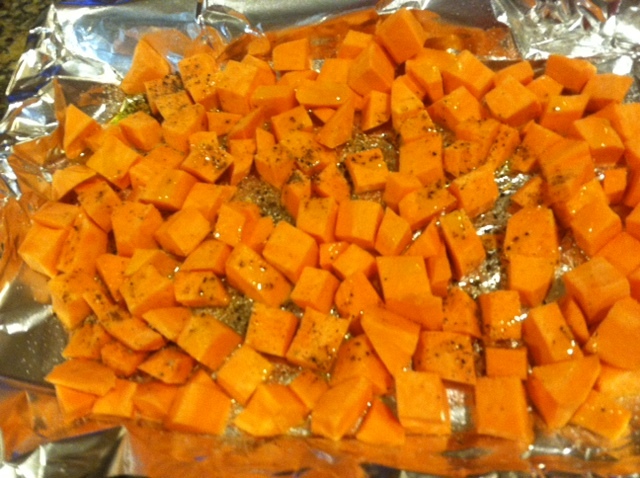 On a baking sheet, toss together the sweet potatoes, oil and salt and pepper. 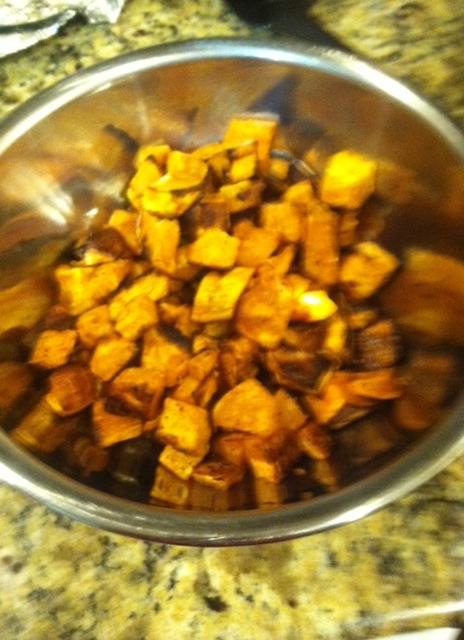 Roast until the potatoes are golden brown and cooked through, 30 to 40 minutes. In the meantime, in a small saucepan over medium-high heat, reduce the cranberry juice by half. Add the brown sugar, butter and cinnamon, stirring to dissolve and incorporate. When the potatoes come out of the oven, add them to a large bowl. Pour the glaze over top and toss to coat completely. Serve topped with the toasted almonds. I fixed this recently for a bridal lunch and a shrimp boil, and it was an instant hit both times. Super easy because you make pretty much everything ahead of time, and just throw it together when ready to serve! My only caution is the sauteeing part — I tend to rush the process thus having to start all over again when I burn the almonds, etc. Photo credit bettycrocker.com. Didn’t get a pic before it was long gone! I go the easy route with coleslaw mix, but you could shred your own cabbage. Enjoy, and I’ll share the recipes for the Shrimp Boil and Crepes Divan next!! Mix together the cabbage and chopped green onions in serving bowl. 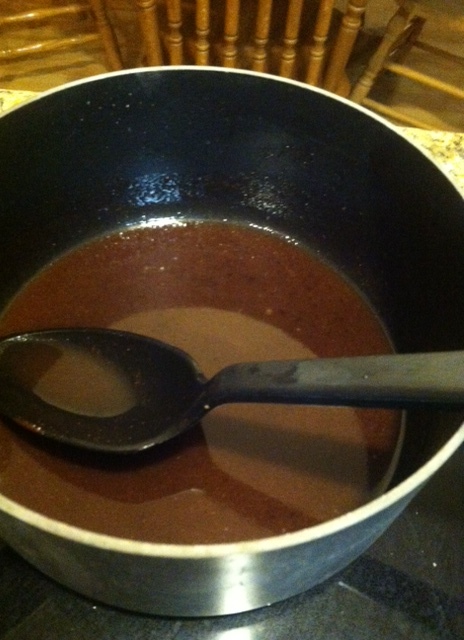 Mix sugar, oil, vinegar, and soy sauce. Stir well or shake until sugar is dissolved. Refrigerate until ready to serve. Brown almonds, sunflower seeds and ramen noodles in margarine. Drain on paper towels and store in plastic bag until ready to serve.